Do you have SharePoint Online and want to better automate and streamline your business processes? Have you heard of PowerApps, Microsoft Flow, or Power BI, but you’re not sure how to use them with SharePoint Online? You’ve come to the right place! 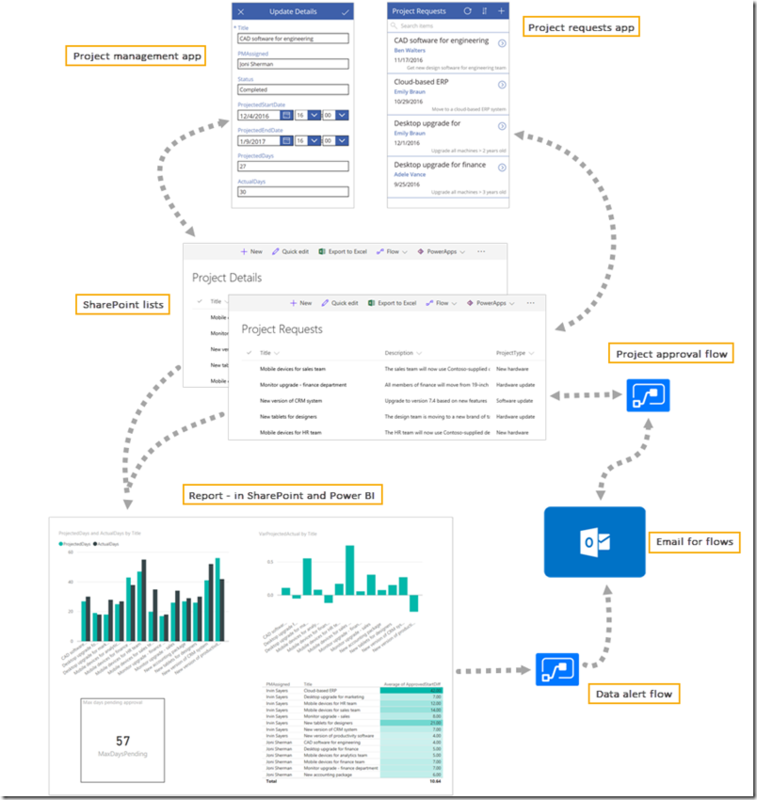 We’ve written a paper that explores how to build out a basic project-management app based on SharePoint lists and three key technologies that integrate with SharePoint Online: PowerApps, Microsoft Flow, and Power BI. These three technologies are all part of the Microsoft business platform, which makes it easy to measure your business, act on the results, and automate your workflows. You can download the entire package, with the paper and the accompanying files, or you can download individual pieces. After you download, open spo-scenario.docx, and follow the paper. The paper describes the role of the other downloads. Before using the sample apps and report, create your own SharePoint lists and update connections in the samples. For more information, see the section "Task 1: Set up SharePoint lists" in the paper. Go to the download page, and click or tap Download. Select all the files, then click or tap Next. Click or tap Save or Save As for each file. When you’re done, we hope you’ll be back to check out the full scenario. Even within the scenario, you can focus on the tasks that interest you, and complete the tasks as you have time. Please send any feedback on the paper to mblythe@microsoft.com.